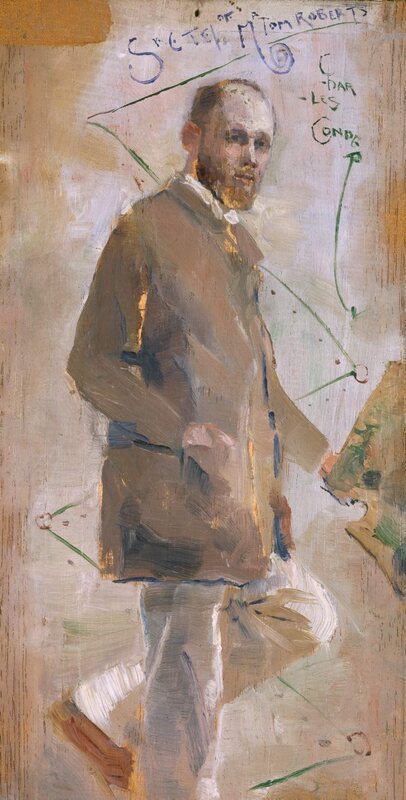 This lively and evocative portrait of Roberts by his friend Charles Conder is a rare work produced during the artist's brief Australian years (1884–90). Roberts is depicted in a relaxed and characteristic pose, on a modernist scale. The playful zig-zagged background – based on a surveyor's chain, referring to the young artist's early employment in Sydney – prefigures Conder's decorative style, characteristic of his later European work, as well as echoing the cover of the 9 by 5 exhibition catalogue which he designed. Signed u.r., blue oil "... C/ -hAR/ -LES/ CONDER". Not dated. Angela Bennie, The Sydney Morning Herald , 'Not just any Tom...', pg. 12, Sydney, 13 May 1997, 12 (illus.). Arts Section. Delys Bird, Dennis Haskell and Ron Shapiro (Editors), Westerly , Nedlands, Winter 1998, 4. Susan Borham (Editor in Chief) and Michael Hutak (Editor), Australian art collector , 'Australian art - it's a local thing', pg. 18, Sydney, Jul 1997-Sep 1997, 15 (colour illus. ), 18. 'Artist as a young man'. Report on Melbourne Art Fair 1997. Wally Caruana and Jane Clark, The Cambridge companion to Australian Art , 'Buying and selling Australian art: a brief historical survey', pg. 290-306, Port Melbourne, 2011, 293, 366. fig.no. 21.1 (colour illus. ), between pg. 268 and 269. Golden summers: Heidelberg and beyond , Melbourne, 1985, 124 (colour illus.). Lauraine Diggins, 19th & 20th century Australian painting, sculpture and decorative arts 1997 , North Caulfield, 1997, 14, 15 (colour illus.). Face: Australian portraits 1880-1960 , Canberra, 2010, 52 (colour illus.). Anne Grey, Tom Roberts , 'Tom Roberts: La vita con brio', pg. 11-30, Canberra, 2015, 16 (colour illus. ), 347. Terry Ingram, The Australian financial review , 'Saleroom. Ultimate grater on offer again', pg. 43, Sydney, 12 Jun 1997, 43. Antipodes: antiques & fine art [vol. 1, no. 2] , 'Sold at the Fair... $265,000', pg. 83, Victoria, 1997, 83 (colour illus.). Photograph of Lauraine Diggins and Michael Blanche at the Melbourne Art Fair in 1997. Hendrik Kolenberg, Look , 'An impressionist gift', pg. 13, Heidelberg, Jul 1997, cover (colour illus. ), 3 (colour illus. ), 13 (colour illus.). Terence Lane, Age , 'Southern lights', pg. 14, Melbourne, 24 Mar 2007, 14 (colour illus.). Bailed up: the story behind the painting , Sydney, 2006, 14-15, 16 (colour illus.). Barry Pearce., Australian artist , 'Charles Conder: lost and found voice of the Heidelberg School', Chatswood, Jun 2003. Barry Pearce, Look: 1953-2003 celebrating 50 years , 'The enigmatic Charles Conder: spotlight on a lesser known Heidelberg painter', pg. 8-11, Sydney, May 2003, 11 (colour illus.). Look , 'Gallery 2003 highlights', pg. 13, Sydney, Nov 2002, 13 (colour illus.). Vivienne Webb, Australian art: in the Art Gallery of New South Wales , 'Golden age', pg. 37-38, Sydney, 2000, 38, 54 (colour illus. ), 300. Judith White, art lovers: the story of the Art Gallery Society of New South Wales 1953-2013 , 'Chapter 5: Be part of the art 1988-2000', pp. 111-138, Sydney, 2013, 115, 257 (colour illus. ).